We could spend hours telling you how wonderful life is here in warm and sunny Arizona! 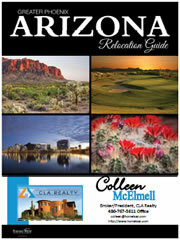 But, we know your time is valuable, which is why we are offering our FREE Arizona Relocation Guide. Just complete the short form below and you’ll be able to instantly download the guide. And don’t worry. We won’t contact you unless you ask us to. But if you’re seriously looking to relocate to Arizona, you won’t find a more dedicated Realtor than the CLA Realty Team — so be sure to call us when you’re ready! Would you like additional information about homes for sale in AZ?